Before the railway came through Nonington in the early 1860’s items such as bricks were very difficult and expensive to move by road and were therefore usually made locally when required. 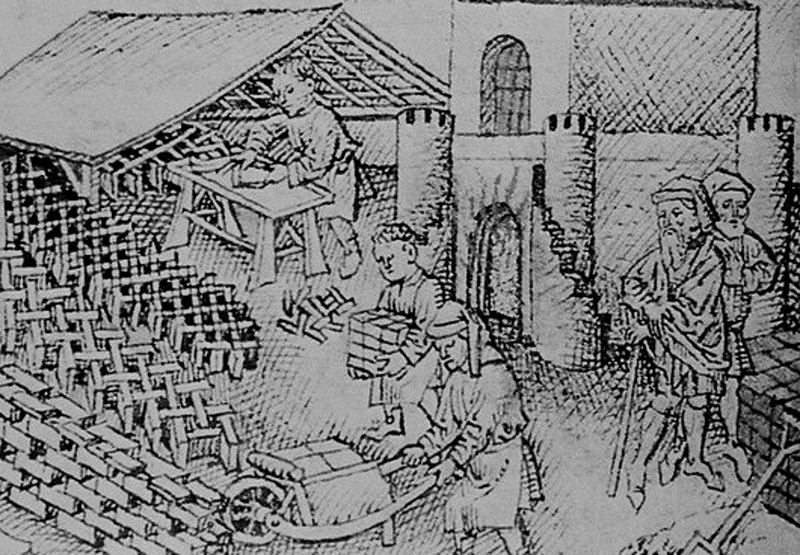 Early brickmaking was hard work in a harsh environment and partly seasonal. In winter the clay was dug by hand and built into piles known as Kerfs about 3ft. high and 20ft. square. Chalk and cinders along with other rubbish were then mixed in and the pile left to weather. 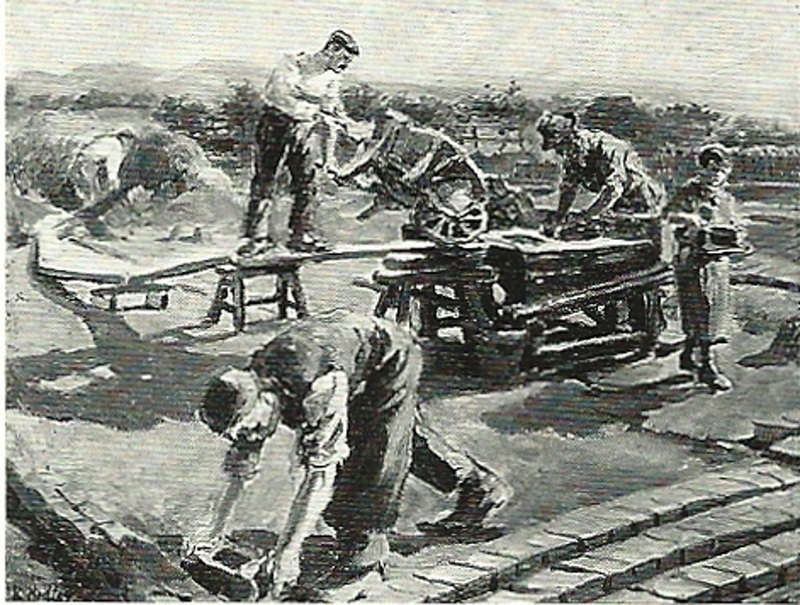 In the spring the process of making the bricks began. The work was organised in gangs usually paid by piecework. 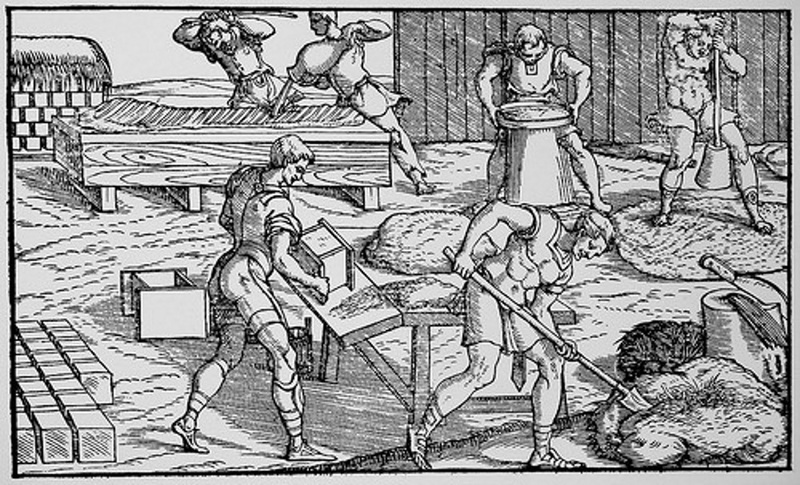 Lumps of the weathered clay were taken to the moulder’s table, often by women and children, where it was mixed with water and combustible material such as cinder and then moulded by hand into the required size and shape in wooden moulds. Other materials, such as ashes, could be added to the clay to alter colour and strength. A foundation layer of burnt bricks containing flues was laid down as insulation from rising damp and the ‘green’ bricks were then stacked with gaps to allow the hot fire gases to circulate. The clamp was then covered with combustible material, burnt bricks and earth and then ignited by small fires started in the special flues in the base which ignited the fuel mixed with the clay in the ‘green’ bricks. This process of burning often took several weeks before the clamp was allowed to burn itself out. Bricks on the outside were burnt and crumbly and usually re-used in the brick making process, the bricks further inside were of a better quality and usable for foundation or other disguised brick work, whilst the bricks in the centre of the “clamps” were of lighter hues and used for facings. 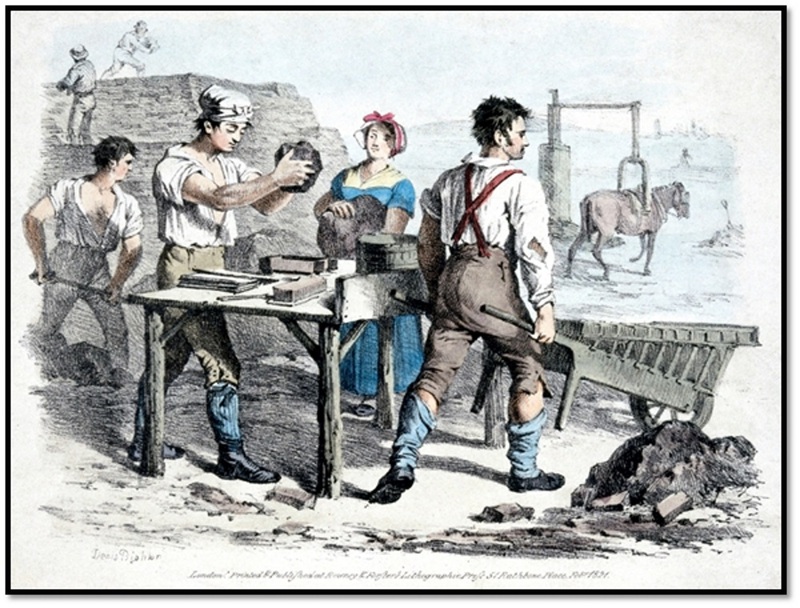 There is evidence of brick-making in the old parish on three sites. On the church side of Butter Street between Holt Street Farm and Church Street is a field still called Brick Field. Little evidence of brick making remains apart from a depression in the ground at the Butter Street entrance into the field probably indicating where the brick-earth was dug out. Across the road from this depression is Cook’s Hill Field, where quantities of broken, burnt clay tile and brick fragments can still be found along the crest of the hill which indicates that the brick-earth was dug in Brick Field but the brick making actually took place on Cook’s Hill. Holt Street farm house and nearby “Ingleside”, just below Holt Street cross-roads, both date from around 1600 and were almost certainly built from bricks made in Brick Field area, but other buildings built with bricks from the same field have been demolished over the years. Further evidence of brick-making in the parish at that time can be found in court records of 3rd July, 1600, which show “Richard Stocke, labourer, and William Knowler, brickmaker, both of Nonington, in £5 each, to appear and for the appearance of Susan, daughter of Richard Stocke”. The old Fredville House was re-built in brick in the mid-1700’s, with the bricks almost certainly made on the brick field in front of what is now Little Fredville House. The 1800’s tithe maps show Brickyard Piece, known locally as Steve Gore’s wood yard, Brickfield Piece and the now demolished Furness (furnace?) Cottage in front of Little Fredville and still well defined depressions in the ground there indicate where the clay was excavated. There is another depression in the ground between the old Fredville House and Western and Humphrey’s Wood which may be the result of the excavation of clay for brick-making. The old St. Alban’s Court House was extensively re-built in brick in the 1550’s and was added to and improved in the 1660’s and 1790’s. The bricks were made very close by in Beauchamps, or Beecham’s, which is just to the south-west of the old house. A 1663 lease of 30th August 1663 between William Hammond of Nunnington, Esq., (lessor) and James Nash, yeoman (lessee) to rent part of the St. Alban’s house and 310 acres of land specifically excludes ‘the liber to make and burn bricks in the ffield called Beechams’. The lease is contemporary to the 1660’s building work and indicates that bricks from the Beechams field were needed for its construction. In the pasture near the western end of Beechams Wood is a clearly visible depression in the ground where clay for bricks was dug, which was until the 1980’s was much deeper, and evidence of the brick kilns used to make the bricks was uncovered during the building of a new residential hostel block for the now closed Nonington College of Physical Education. A new St. Alban’s Court mansion designed by the eminent Victorian architect George Devey was built in the 1870’s for William Oxenden Hammond by Adcock’s of Dover. The 1871 census lists Mr. Maxted as a builder and brick-maker employing 16 men and boys with a house and premises, with its own lime kiln, in Esole Street indicating that some locally made bricks were used in a least part of the building’s construction with locally produced lime in the mortar used to lay them. This would have given much needed local employment in a time of agricultural depression which had resulted in a steady decline in the population of Nonington as people used the recently opened railway to migrate to larger towns in search of better paid and more regular employment. In common with most other parishes Nonington also had lime burning sites. Limekiln Wood near Frogham is the most easily identifiable from its name and the quarry, kiln and attendant buildings are clearly and accurately shown on the 1859 tithe map and when the lime-kilns went out of use the quarry was used as a dump until the late 1960’s when it was finally filled in and top soiled over, leaving only a depression in the ground to show where it was. 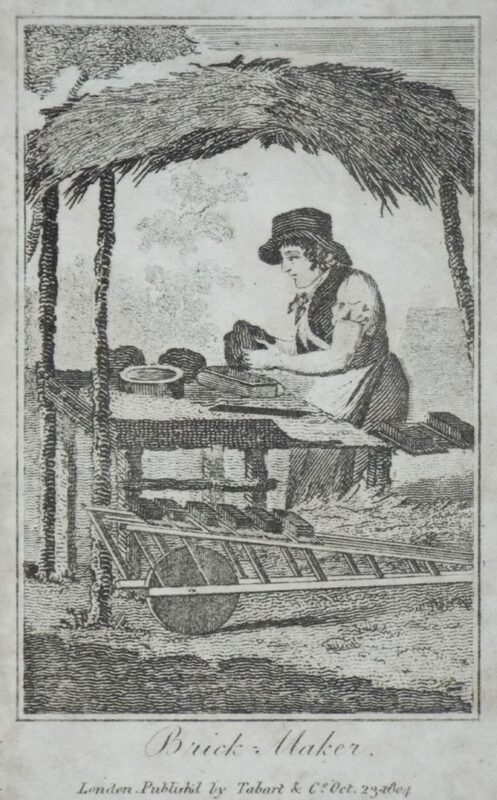 Over the centuries chalk was excavated at many different places in the parish provided the raw material to make lime for building and agricultural use. Hi, I am looking for any information relating to the brickfields in Willesden.a large proportion of my ancestors lived in cottages on the brick field. The surname was Pretty, they where brick moulders and labourers. Thanks. Sorry, I have no information. Willesden is in the old county of Middlesex,about 80 miles away. You could try looking for family history organizations in that area.